Prevent the Maulborn from completing their scheme inside the Tribunal Temple. Daedric portals have opened in the Temple! A large Maulborn force used the sewers to sneak into Mournhold. I need to find them before they can complete their nefarious plan. Talk to Almalexia outside the Tribunal Temple in Mournhold. Pray at the altars of the Three and receive their blessings. Stop the Maulborn threat inside the High Chapel. The small group of Maulborn escaped from the Mournhold Underground. Almalexia needs you to report to the Tribunal Temple right away. She is floating outside the temple, near where you met Naryu Virian during A Favor Returned. The Maulborn entered the temple and opened Daedric portals. Almalexia sends you to banish the Daedra while she finds out what the Maulborn are up to. There are three Daedric portals to close inside the temple. After they are closed, pray at Almalexia's altar in the southwestern corner of the temple. 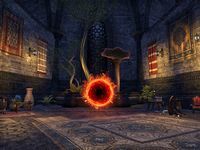 She says Magistrix Vox used Daedric magic to bypass the wards around the High Chapel, then opened an Oblivion gate to fill the temple with Daedra. Vox wants to desecrate the temple, steal the holy artifacts and loose Daedra on Mournhold. In order for you to enter the High Chapel, you need the blessing of each of the Three. You have Almalexia's blessing, so now you need to pray at Vivec's and Sotha Sil's shrines and complete their tasks. 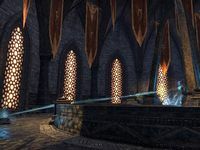 Vivec's altar is in the southeastern corner of the temple. Almalexia appears and explains the trial to you. Vivec's trial measures your wisdom and judgement. A temple worker, Vamen, killed Belronen Telvanni in a duel. You must act as Vivec did, questioning the witnesses and determining who truly slew Belronen. First, talk to Vamen. A small cut on Telvanni's arm was enough for Vamen to win. You can choose to blame him, or continue looking for a culprit. Telvanni's body has one wound: a small cut on his arm. There is a crumpled note in his belt. It looks like someone called V threatened to turn Telvanni into the temple for his trade in Daedric artifacts. Fenila Redoran says you, as Vivec, should kill Vamen. Talnus Indoril says Fenila lent Telvanni her blade before the duel. Indoril insisted Vamen and Telvanni switch weapons, and Redoran fumed when it happened. Galdsa Dres says Fenila stoked Telvanni's rage, urged him not to back down and called herself his friend. Morami Hlaalu says Belronen's death brings shame to House Telvanni. You can continue to question the witnesses after the objective Investigate the Crime is completed. Talking to Hlaalu reveals she sold Redoran the poison and wrote the threatening note. You can accuse her or continue to question the others. Once you accuse one of them, the spirits fade, and the Enigma of Vivec will appear. Vivec rewarded Fenila Redoran for her cunning, but House Redoran suffered for poisoning a Telvanni. Morami Hlaalu was the one punished for the crime, but House Hlaalu was rewarded for exposing a heretic. Sotha Sil's altar is at the north end of the temple. Almalexia says Sotha Sil values intelligence and ingenuity. Your goal is to repair the Dwarven Arbiter of Perfection. Turn the left Dwarven mechanism two or three times and defeat the three Dwarven spheres. Each Dwarven sphere drops two or three dynamo cores. Since you need five, you need to turn the switch at least twice. Turn the right Dwarven mechanism, and a Dwarven spider will appear. Defeat it and collect the three spinning gears it drops. Interact with the Arbiter of Perfection, adding five dynamo cores to the sockets and three gears to the pegs. Once complete the Arbiter will attack. Defeat it, and the Enigma of Sotha Sil appears. Perfection is unattainable, the Enigma explains. Inside the chapel is Maulborn priest Sathram. You need to activate the Relics of Almalexia, Sotha Sil and Vivec in that order (Almsivi) to be able to reach him. Defeat him, and exit the temple. Talk to Almalexia just outside the doors. The Maulborn sacrificed their own troops so Vox could escape with the Judgment of Veloth. Almalexia names you one of her Hands and gives you a reward and 1 skill point. An Ordinator informed me that Almalexia wants to see me at the Temple. Almalexia informed me that the Maulborn unleashed Daedra into the Tribunal Temple. I should enter the Temple and banish the Daedric invaders. Daedra have invaded the Tribunal Temple. I need to destroy them and close the portals that spawn them. I eliminated the Daedric threat. Almalexia said to find her altar when I was finished. It's in her cloister. I prayed at Almalexia's altar and now I should speak with her. Almalexia informed me invaders still hold the High Chapel. The combined powers of the Tribunal protect the area from mortal entry. 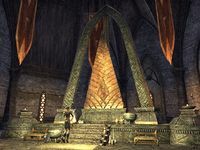 To enter the High Chapel, I need to attain the blessings of Vivec and Sotha Sil at each of their altars. I need to find a way to repair the Arbiter of Perfection, and then I need to destroy it. When I'm done, I should receive the blessing of Sotha Sil. The trial of Sotha Sil involves repairing constructs and then destroying them. I should examine the Arbiter of Perfection and its surroundings to get started. I should speak with the Enigma of Sotha Sil to receive its blessing. I received Sotha Sil's blessing. Now I should go to Vivec's cloister and pray at the altar to start his trial. I need to find the one in Vivec's trial who is guilty of the murder. To do that, I'll have to talk to everyone to find out exactly what happened. In order to receive Vivec's blessing, I need to pass his trial. I should speak with Almalexia to ask for advice. I should speak with the Enigma of Vivec to receive its blessing. I received the three blessings of the Tribunal. Now I should enter the High Chapel and hunt down the leader of this invasion force. I found a Maulborn high priest in the High Chapel of the Tribunal Temple. He must pay for his crimes. I should search for Almalexia outside the Tribunal Temple. Finishes quest I defeated Vanus Sathram and saved the Tribunal Temple, but Vox escaped with the Judgment of Veloth. I should tell Almalexia what happened. This page was last modified on 14 April 2019, at 02:28.